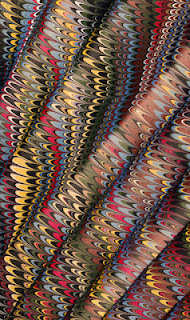 Tell us about your process of creating hand marbled books and silks. We love to show people how marbling is done. It seems counterintuitive to see someone sprinkle paints on the surface of a liquid, comb intricate designs on the surface of that liquid and then in an instant be able to permanently capture that pattern on paper or fabric. In a year we may marble 400-500 yards of silk and hundreds of sheets of paper. How is your art unique? Initially, as casual practitioners of the art, we had little appreciation of the depth of the craft, yet 26 years later we are humbled by our constantly growing understanding of the history, science and artistic dimensions of the art of marbling. The science of marbling is enough to challenge the best of chemists. My husband Dan, a chemist at heart, is always looking for the why and how of it. Totally free of the science and/or history of it, a well-executed marbled paper will illicit wonder and admiration as it finds its perfect place in a well bound book. How does a married couple work together? Chena River Marblers has existed for 26 years. Dan has been an integral part of our whole as bookbinder, builder of all tools, practitioner of old-style marbling, historian and chemist. Over the years, I have specialized in marbling beautiful papers for hand bookbinders. Dan is our own hand book binder. The books that are sold by Chena River Marblers are made either by Dan or under his direction and beautified by our own hand marbled papers. Well, you know one does not grow up thinking, “I want to be a marble.” It wasn’t even on the list. Its existence was unknown to me, but the desire to create beautiful things and to work with my hands was always there. Early in the 1980’s some marbling on a greeting card caught my eye. It was several years later, after we had moved back to Western MA and found ourselves in a vibrant book arts community, that I had an opportunity to study with Faith Harrison, a nationally known production marble. Soon after that Dan began his bookbinding studies with Bill Streeter. There is no school of marbling. Why should visitors buy from local living artists, other than to support them monetarily? There is much to gain from having the opportunity to meet an artist. A few questions open up a world of understanding about an object that might simply have been admired. We love getting a chance to share with our customers our excitement about the work. As a collector, I particularly cherish the pieces that come with the added memory of having heard the artist’s thoughts about the work.